I was thrilled last week at the Farmer’s Market to purchase this organic squash. 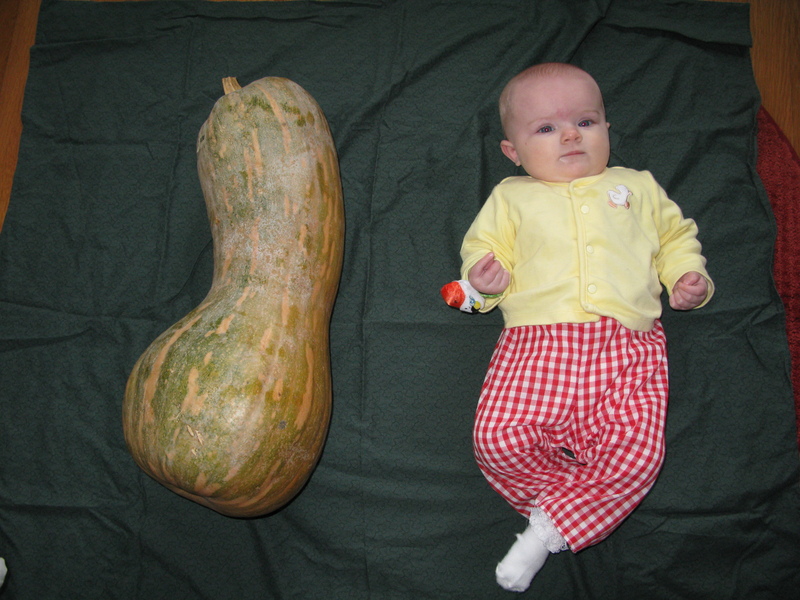 The farmer told me the name of it, which I promptly forgot, but I can tell you that it weighs 20.5 pounds, which is over 4 pounds more than Evelyn’s current weight. Apparently, this particular variety tastes like a summer squash, even though it’s a winter squash. But the best part–the reason I was so excited about this big baby, was that it cost $4.00. It’s certainly giving Miss E a run for her money. Evelyn eats a lot of squash these days. She seems to like it. Honestly, she seems to like everything she’s eaten so far including: bananas, apples, pears, beets, rice cereal, rice, butternut squash, pumpkin, turnips, applesauce, pear sauce, a barley teething biscuit, and pureed stew. I got this recipe from my sister Liebe several years ago. I make it on a regular basis. Next week, when I’m making some of the pies for my brother’s grooms dinner, I’ll spread this on a shortcake tart in honor of Thanksgiving Pumpkin Pie, only a bit less conventional. Measure pumpkin, pecans and pie spice into a large kettle. Measure sugar into a different bowl. Stir fruit pectin into pumpkin mixture. Add butter. Bring mixture to a full rolling boil on high heat, stirring constantly. Quickly stir in all sugar. Return to full rolling boil and boil for exactly 1 minute, stirring constantly. Remove from heat. Skim off any foam with a metal spoon. Ladle quickly into 5 1-cup canning jars, filling within 1/8″ of the tops. Wipe jar rims and threads. Cover with lids; screw bands tightly. Process in a boiling water bath for 5 minutes.